QUEZON CITY – Rights groups SELDA (Samahan ng Ex-Detainees Laban sa Detensyon at Aresto) and Hustisya condemned the death of Benny Barid, political prisoner at the New Bilibid Prisons Maximum Security Compound, Muntinlupa City, who died at 11:00 AM, September 18, at the NBP Hospital. “We hold the Aquino government accountable for the death of Benny Barid. His death is the face of martial law in our country today. He suffered and died because of the cruelty and injustice of this government that speaks of ‘democracy’ but denies the right of political prisoners to be free,” said Cristina Guevarra, Hustisya secretary general. For three years, Barid had stayed as a patient at the NBP Hospital. He suffered from chronic asthmatic bronchitis with emphysema. He cannot stand up alone, and needs to be put in a wheelchair to move from one place to another. Fellow political prisoners are the ones who look for means to acquire his needed medicines. His further stay at the NBP Hospital has made him more vulnerable to various diseases. Fellow political prisoners at the NBP mourned at the death of their kosa and kasama, but likewise demanded justice. “Halos tatlong taon siyang nakaratay sa NBP Hospital sa labis na panghihina dahil sa kanyang karamdaman na kanyang ikinamatay. Nagpapaabot po kaming mga bilanggong pulitikal sa pamilya at kaanak ni Barid ng aming lubos na pakikiramay. Salik ang malaking kakulangan sa sapat at maayos na serbisyong pang-piitan sa mahirap na pinagdaanan ni Barid. Gayundin, nawalan na ng pag-asa si Barid dahil sa kawalan ng kongkretong hakbang ng gobyerno ng Pilipinas upang tugunan ang makatarungang pagpapalaya sa lahat ng bilanggong pulitikal. Tuloy ang laban para sa kalayaan!” said the NBP political prisoners in a statement. Exactly a year ago, Alison Alcantara, 55 years old and also a political prisoner at NBP, died of pneumonia, sepsis and fatal arrhythmia. He was only brought to the Philippine General Hospital after he fell into a coma at the NBP Hospital. “How many more ailing political prisoners will suffer from the dire and subhuman conditions inside different detention centers in the country? How many more after Alison Alcantara and Benny Barid?” said Guevarra. Arrested in July 2006, Barid was accused of involvement in a massacre which happened in 2004. His child was allegedly hostaged by the military to force him to surrender. He was a victim of trumped-up charges four times, the last of which he was sentenced to three counts of lifetime imprisonment in the NBP Maximum Security Compound. He was a political detainee of the Marcos dictatorship, but was granted amnesty under the Cory Aquino government. He was again arrested sometime in 2004 for subversion and illegal possession of firearms. The case was dismissed, but his lawyer was killed after handling his case. In 2005, the military detained him for almost two months, when they searched his house and allegedly found firearms in his possession. In all incidents, the military and police consistently pinned him down as a member of the New People’s Army. SELDA to BS Aquino: Free ailing political prisoners now! SELDA, meanwhile, dared the Aquino government to immediately release ailing political prisoners on September 21, the 42nd year commemoration of martial law. The group said decades after the martial law years, the Philippines continues to face the bleak reality of the existence of political prisoners. Rights of political prisoners are repeatedly violated as they are slapped with trumped-up criminal charges, arbitrarily arrested and illegally detained. Many of them are tortured and denied their right to counsel and due process. They suffer inhumane prison conditions and prolonged imprisonment, and snail-paced judicial process. 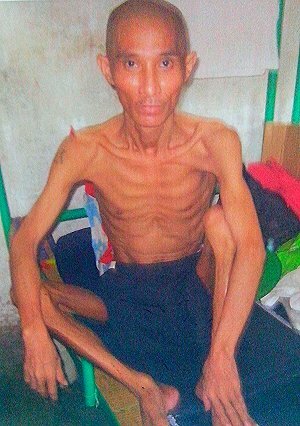 Of the 504 political prisoners in the country under the Aquino government, 53 are ailing political prisoners. “Pres. Aquino’s hands are bloodied with the death of ailing political prisoners. His government’s callousness and injustice against them are no different from Marcos. The Aquino government perpetuates the culture of impunity. We call on the people to unite and demand justice and freedom for all political prisoners!” ended Clamor. Ramon Aboitiz Foundation Inc. (RAFI) President Roberto Aboitiz gestures as he emphasizes the point that aside from building classrooms, all stakeholders should also invest in building competence, and citizenship of the students. CEBU CITY – The Ramon Aboitiz Foundation Inc. (RAFI) and 12 local government units (LGUs) of Cebu yesterday (September 19) entered into an agreement for the repair and construction of 218 classrooms that would benefit an estimated 9,800 students. The classrooms include those in schools in towns severely hit by super typhoon Yolanda last November 8. He likewise exhorted the LGUs to maintain the same enthusiasm in partnering with RAFI in this project. Mayors and or the representatives of the towns of Alcoy, Aloguinsan, Asturias, Bantayan, Barili, Borbon, Carcar, Naga, Madridejos, Samboan, San Remigio, Sibonga signed separate agreements with RAFI for the P144-million school rehabilitation project (SRP), as a continuing commitment to provide the school children with a safer and more conducive learning environment. As stipulated in the agreement, the 12 LGUs were expected to provide funds for manpower requirements as counterpart for the rehabilitation of their schools, among other obligations. The 12 LGUs have also committed to assume full responsibility of the actual implementation and execution, from inception to completion, of the rehabilitation works, in accordance with the project terms of reference and of the SRP. RAFI, on the other hand, would commit to extend assistance to the LGUs through the provision of construction materials based on the approved scope of works, program of works, and bill of materials. Speaking on behalf of the other LGUs, Tuburan Mayor Democrito Diamante thanked RAFI for the assistance in repairing and constructing classrooms in his town. He also requested that the foundation help his town in the successful implementation of the K-12 program in 2016. In the same event, RAFI also honored three municipalities for their active participation in RAFI’s SRP. The local government units of Asturias, Tuburan, and Bantayan were recognized after being able to rehabilitate more than 50 classrooms (Asturias, Tuburan) and more than 100 classrooms (Bantayan) affected by super typhoon Yolanda. “By having this recognition, we would like to show the public that these LGUs that are actually helping and are really prioritizing education by partnering with us in this endeavor, in this school rehab,” said Anton Dignadice, RAFI Education Development Unit executive director. The recognition was meant to highlight the efforts and contributions of RAFI’s SRP partners and to encourage participation and partnership of the local stakeholders in the foundation’s projects. “In RAFI, one of our key attributes is collaboration. In everything that we do, including promoting education we always involve partners; we always try to engage the stakeholders. They are really a key element in the success of the project and so, we would like to recognize those partners who have actually helped us in ensuring the success of the project,” said Dignadice. He said that the citations mean that the three municipalities have partnered with RAFI for a certain time and that they provided counterpart funding for SRP. Yesterday’s recognition and agreement signing took place at the RAFI-Eduardo Aboitiz Development Studies Center on Lopez Jaena St., Cebu City. MANILA – With just a few days away before President Benigno Aquino III delivers a speech at the United Nations Climate Summit in New York, Greenpeace today challenged the Chief Executive to end his “coal addiction” in light of climate change and climate-influenced disasters, fuelled by dirty fossil fuels. Greenpeace raised the alarm over President Aquino’s recent statements during a business forum in Davao City, where he declared that coal is the most viable power source in Mindanao, also asserting how the country’s renewable energy (RE) is limited and may be more costly. Coal is a highly polluting energy source and emits much more carbon per unit of energy than oil and natural gas. Coal burning is one of the leading contributors to climate change. The environmental group said that despite growing evidence of climate change affecting highly vulnerable countries like the Philippines, the Aquino government continues to approve more coal-powered plants as the country’s main source of energy. In fact, the current Philippine Development Plan 2011-2016 prioritizes coal-fired power plants in the coming years. More than 34% of the Philippine’s power generation comes from coal. A new Greenpeace report, True Cost of Coal in the Philippines, gave estimates on how coal has disadvantaged the Philippines in terms of economic losses related to environmental and health impacts, and more. To make matters worse, the current administration has 45 new coal projects in the pipeline, this would increase the Philippines’ carbon dioxide (CO2) emissions by over 64.4 to 79.8 million metric tons a year. Building more coal-fired power plants would undermine the Philippines’ role in any international agreements to tackle climate change. Meanwhile, the Aquino government continues to snub the country’s renewable energy sources which are naturally abundant in the Philippines, creating clean jobs and green growth. Renewable energy provided over 26% of the country’s electricity generation in 2010. In fact, RE has the technological potential to contribute to more than 50% of the Philippines’ energy needs by 2020. Worldwide, RE power generation is growing, providing one-fifth of the world’s electricity and has added about half of the world’s new generating capacity each year since 2008. “It is obvious that President Aquino is merely paying lip service to prioritizing climate change adaptation and mitigation measures for the country if he continues to burn more coal in his own backyard. He is also grossly misinformed about the potential of RE sources to adequately provide for the growing power needs of the country, especially in Mindanao which also relies on solar, geothermal and hydrothermal plants,” added Muni. Greenpeace believes that it is not too late for Aquino to change his energy policies, and calls on the President to take the lead and be part of the global solution to climate change by embracing clean and renewable energy as the foremost long-term solution to the country’s growing power needs. “With the country perennially battling extreme weather events, we need to face facts and act now. The Philippine Climate Change Commission, the Department of Energy, and the President himself must set us on a clear path to quit coal,” said Muni. 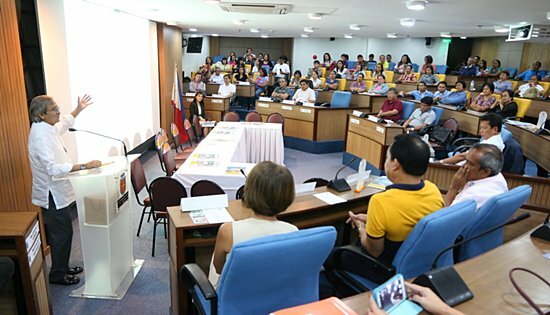 PASAY CITY – Senator Chiz Escudero is proposing a “grading system” that will track down education expenditures after education officials failed to report on the status of classrooms built, books bought, teachers hired this year, for which Congress appropriated billions of pesos during the Department of Education’s (DepEd) budget hearing last Wednesday. The senator first asked how many of the 33,194 teachers who were supposed to be hired this year have joined the DepEd workforce. Escudero also inquired how many of the 43,183 classrooms programmed to be built in 2015 have been completed. DepEd officials replied that they did not possess the information on how many brand-new classrooms have been turned over and being used. Escudero’s next questions – on how many of the 42.6 million books have been bought and if 1.6 million new chairs have been delivered – also merited the same reply: No data available. “Ang approved national budget ay parang lesson plan sa pag-gasta. Pag ganyan kababa at kabagal ang ating pag-gasta ay lalo nating pinapatindi ang problema sa ating mga pampublikong paaralan,” he asked DepEd brass. “Ang assumption kasi natin ay ang General Appropriations Act (GAA) ay mismong release document na. Kung ganun, bakit naaantala pa ang pag-implement nito?” Escudero said. Because Congress saw to it that the GAA will take effect “on the first hour of the first day of the first month of the year” then agencies are not pressed for time in utilizing funds, Escudero added. “Maiintidihan ko ang anumang delay kung March na halimbawa ang effectivity ng budget. Sa ngayon na sabay ang bisa ng national budget sa pagpasok ng bagong taon, wala akong nakikitang acceptable na alibi,” Escudero said. “When we approved your request, in full and without deduction, you entered into a contract with us that the personnel will be hired and the equipment will be bought in time for the start of the school year and you have a six-month lead time,” he said. For 2015, government will open up 39,066 teaching positions at a first year compensation cost of P9.3 billion. “Dapat siguro lagyan ng special provision ang budget item na ito na dapat ang recruitment process ay January pa lang simulan na para tapos ang vetting, nakapirma ng kontrata at nakasumpa nab ago ang pasukan,” he said. A selection window of six months is more than enough, Escudero insisted. Escudero also noted that there is P52.88 billion in the DepEd “wish list” for 1.3 million chairs, 31,728 new classrooms, for the repair of 9,500 classrooms, the purchase of 1.3 million seats, and the setting up of 455 vocational laboratories. “Sa classrooms, dapat we hit the ground running in January. Kasi hindi maulan sa first half ng taon at summer. We take advantage of the good weather and we ready the rooms in time for class opening in June,” he said. “These must be procured in the fastest time possible without circumventing procurement, accounting and auditing rules,” he said. QUEZON CITY – SELDA criticized the Human Rights Victims Claims Board (HRVCB) for continuously refusing to state categorically that it recognizes as victims the 9,539 members of the class suit against former Pres. Marcos in 1986. Aside from the 9,539 class suit members, there are also 24 direct action plaintiffs who have been recognized and verified by the US Federal Court in Hawaii. “The HRVCB itself is violating the law. Conclusive presumption becomes disputable presumption in their denial to recognize the victims who have time and again proved they suffered abuses and rights violations under the Marcos dictatorship,” said SELDA chairperson Marie Hilao-Enriquez. “The framework of the HRVCB in its process of accepting applications is not aimed at recognizing the most number of martial law victims. The actual conduct of the claims board on the ground is also not encouraging either for them to file. They are treated like persons who are only after money, of a very small amount that can never make up for their sacrifices and sufferings as victims. They are after justice and reparation,” Enriquez said. “Survivors of martial law are being victimized again, this time by a body formed by Pres. Aquino led by a former state agent with lack of sense of history and complete knowledge of martial law. Their actions and pronouncements lead to disenfranchisement of victims,” Enriquez added. The group said Pres. Aquino is the one to blame that he appointed a former PNP general as head of the HRVCB. Martial law victims previously condemned the appointment of Sarmiento, saying it is an insult to victims that a former member of the Philippine Constabulary, forerunner of the PNP which led and implemented the worst form of rights abuses under martial rule. MANILA – Around 100 fishermen from the Save the Fisheries Now Network (SFNN) trooped to the Makati Business District to deliver a letter to the European Union (EU) Delegation, citing complaints against the Aquino government for hastily amending the Philippine Fisheries Code (RA 8550), which the president will be presenting to the EU Council in Brussels, Belgium later today. The group said that the Fisheries Code was quickly revised without due process, after the Philippines received a “yellow card” sanction from the EU over the country’s failure to combat Illegal, Unreported and Unregulated Fishing (IUUF). The sense of frustration among small-scale fisherfolk left them no alternative but to send a distress call to the EU Delegation in Manila. SFNN sent a letter to the EU Ambassador Guy Ledoux in Manila, since part of President Aquino’s agenda in Europe is to assure the European Community that drastic measures are now being taken to deter IUUF. Illegal, Unreported and Unregulated Fishing has long been the scourge of Philippines seas and remains a big threat to small-scale fishermen who easily lose their fish catch to large commercial fleets that encroach on municipal waters. SFNN is deeply concerned that trade-related incentives, concerning tuna imports bound for the European markets, were government’s only consideration for complying with EU regulations. "We’ve long asked help from the government to combat IUUF but it seems they will do whatever it takes to continue ‘unlimited fishing’, even step on the rights of marginalized fisherfolk, just to satisfy the greed of large tuna companies," said Ruperto Aleroza, spokesperson of the Pambansang Katipunan ng Samahan sa Kanayunan (PKSK). Save the Fisheries Now Network said that the Bureau of Fisheries and Aquatic Resources (BFAR) convened a meeting in August, mostly attended by the commercial sector and non-government organizations, but with hardly any representatives from small-scale fisheries. SFNN questioned BFAR’s lack of transparency and accountability, arguing that the government should have given all stakeholders enough time to study and even propose provisions that should have been included in the Fisheries Code amendment. While the group agreed to the high penalties to be imposed on violators, the lack of consultation makes the amendment process undemocratic and discriminatory.